Date Added: Sunday 11 July, 2010 by COCHE S.
This is a BEAUTIFUL jacket ! I love it, it is awesome and it is superbly beautiful. Very nice work, very successful, exactly as I wanted. I can not help but admire him, and all around me I have received nothing but compliments. Thank you Indy, is one of the most beautiful jacket I\'ve owned and seen ! I can only say, CONGRATULATIONS and I will take very careful of my jacket. You\'re up to your reputation !.. Date Added: Tuesday 09 March, 2010 by Andrew M.
Just got the jacket you made. All I can say is WOW! What a great looking coat! I am getting compliments on it from strangers! Thank you for the pre-distressed white stripes... great look. It is well made, fits great, and looks fantastic. Dare I say this could be the best jacket I've owned?.. Date Added: Wednesday 07 October, 2009 by Calvin B. Date Added: Thursday 12 March, 2009 by Rocco C.
I DON'T WANT TO TAKE THIS JACKET OFF, EVEN THOUGH ITS BEGINNING TO ANNOY MY WIFE. THIS IS THE BEST FITTING, BEST LOOKING, AND HIGHEST QUALITY JACKET I HAVE EVER OWNED, PERIOD. THE CUSTOMER SERVICE FROM START TO FINISH WAS SECOND TO NONE, AS IT ALWAYS HAS BEEN SINCE I'VE FOUND MAGNOLI CLOTHIERS. THE THICKNESS AND STRENGTH OF THIS LEATHER MAKES ME THINK IT WILL SURLY OUTLAST ME. EVEN SO I PLAN ON ORDERING ANOTHER LEATHER JACKET FROM MAGNOLI EVERY CHRISTMAS. ANOTHER HERO JACKET WILL DEFINATELY BE ON THAT LIST. THANK YOU INDY, I COULD'NT BE HAPPIER. ALSO THE SCREEN ACCURACY IS AMAZING. BUY THIS JACKET!.. Date Added: Monday 06 October, 2008 by Christopher B. This is not only in every way a superb jacket but it was also made by the finest company I have ever come across! This is actually my first ever leather jacket I have come to own and when I came across Magnolis, I must say the courtesy, service, trust and the support on purchasing from them, was among the best I have ever experienced. I especially mention trust here, as I come from Germany and sending money and measurements half way across the globe to Newzealand to a company one has never done business with before for a product one has never previously owned and with your own measurements in question, it takes a lot of trust to do so. But in the end I was proven so right to have done business with Magnolis. The hardest part though was getting the correct measurements, do you measure snug, fitted, relaxed and so on. But Magnolis was fantastic, they helped me in every manner and not only that, they sent the jacket on a special request within 3 weeks, take that for service! From what I can tell and from what I hear from my friends, that are pretty much experts in the fields of leather jackets, that it is of superb quality and that the craftsmanship is spot on. I personally can say that from wearing the jacket though, that the fit is perfect and only a Hero jacket owner will probably understand when I say you become a different person when you slip it on! ;) To sum it all up into one sentence then, I guess if you do not own a Magnolis HERO Leather Jacket then you are definately missing out!.. Date Added: Monday 08 September, 2008 by Scott M.
It is no wonder that people seem to return to Magnoli Clothiers... 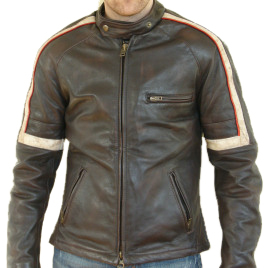 I purchased the Hero Jacket (New - Goatskin version) and upon receipt saw how exceptional the jacket was (both in workmanship and looks; the dark brown leather of the jacket is really set-off by the contrasting white racing stripes [predistressed on mine]). Magnoli Clothier's HERO jacket has instantly become my favourite jacket, and although winter here is coming to a close, I am eagerly awaiting next winter when I can don the jacket again. Not only is the jacket exceptional, but so is the service. Indy Magnoli made the purchase easy and pleasurable and went so far as to assist me personally with my measurements (granted that I was in NZ at the time). The experience overall has been a positive one. I think the hardest part is getting the correct measurements, but after that the experience and the professionalism of Magnoli Clothiers come into play... and the end result is a GREAT jacket to wear for years to come. I can HIGHLY recommend this jacket to any prospective buyers...it is definitely worth the purchase!! !..